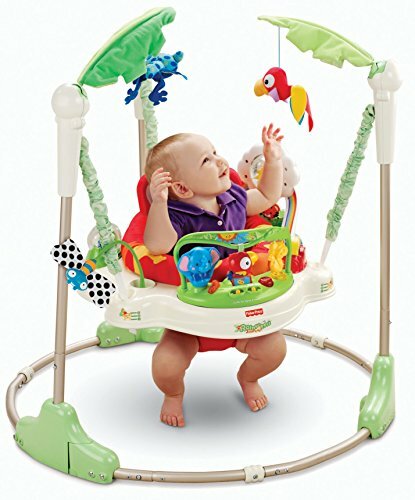 The Fisher-Price Rainforest Jumperoo is a baby jumper designed for use by a child who is able to hold his or her head up without help, yet not able to walk or climb out. No doorway is required for this jumper to have your baby jump safely. Lights and sounds are features of this fun jumper. The toy bar is soft-sided overhead and has two woodland friends spinners. Also included is a light-up musical piano. Every time your baby jumps, lights, music, and sights go off. Everywhere the baby looks, there is some type of stimuli of fun. Busy toys, bobble elephants, and swinging monkeys are all a part of this jumper. This baby bouncer folds up for easy storage and portability. The seat spins 360 degrees so your baby can discover and look all around. A sturdy, free-standing steel frame makes sure that your baby is safe when he or she jumps. The jumper adjusts to three different heights as your baby grows. Soft spring covers help to keep your little one's hands safe. Busy activities include a peek-a-boo tiger, bat-at monkey, rattle lizard, bobble elephant, spinner drum, and more. A soft and comfy seat pad is machine washable and dryer safe. The jumper requires 3 AA batteries. The maximum weight is 25 pounds and the maximum height is 32 inches. The jumper weighs 16 pounds and the dimensions are 37 X 32 X 32. As of this writing, there were 5,719 customer comments and 233 answered questions. I've read the reviews and also the answered questions and then condensed the results into this report. "I've been buying Fisher-Price items for years because of their quality and safety features compared to other brands. The design of this baby bouncer is amazing. My baby loves the colorful games. It keeps him occupied for a good while, which gives me plenty of time to organize his clothes and some other stuff." "Overall this is an excellent product for a reasonable price! I would recommend this to everyone." "I definitely recommend this product to any moms or dads out there!! Worth the price, and it makes my baby happy." "Got this for my daughter at 5 months and she still loves it at 7 months!! It is super durable and well made and one of her favorite past times 🙂 100% recommend to anyone and everyone!! It is a huge life saver! My mom even ordered one for her house she loves it so much! Had it for several months now and have not had to change the batteries once! The lights and music are awesome and she loves how they come on when she jumps!" "At 5 months my grandson enjoys playing with all of the toys on the bouncer, and the music and sound effects can be turned on or off. Babies need a change of pace so he goes from one-on-one attention to this to tummy time or his play mat. He loves the bouncing feature and caught on to that almost immediately. It's good for building strength in his legs and the toys are good for hand-eye coordination. He loves to grab the big bug that hangs over the side and examine it and hit it on the side of the seat. He also holds the elephant, parrot, and monkey and looks at them closely. Like anything else, this has to be used in moderation. It isn't a babysitter, and a baby shouldn't be left in it any longer than he can tolerate it or find it interesting -- and not more than 15-30 minutes anyway." There was some confusion on what size of a child could fit in this jumper. The recommendation is that the child needs to be able to hold their head up unassisted, though not too big to be able to crawl or climb out. Some parents improvised by putting a book or pillow under the jumper if there baby was too small. "My 6 month old is a little taller than average and average weight. I wanted one that wasn't huge, and wasn't going to be too tall for her to bounce in which according to reviews, all the newer ones were. The size is perfect for her, so if your looking for one that will hold a younger baby, and won't have to put a book or pillow under, this is it! It has 2 settings on the music, and doesn't take up half my living room." If you are looking for a fun and reasonably priced baby bouncer for your little one, The Fisher-Price Rainforest Jumperoo might be a great option. It has music, lights, and lots of fun games for your child to look at and play with. This is a free standing jumper and not a door jumper. I hope my review helps you as you look towards purchasing the best baby bouncer for your child in the future. For more information, check out our article The Top Ten Baby Monitors Of 2018.